We are huge fans of Tim Westergren, who wrote the textbook on scrappy startups having founded and led Pandora through the tech implosion of the early 2000s. 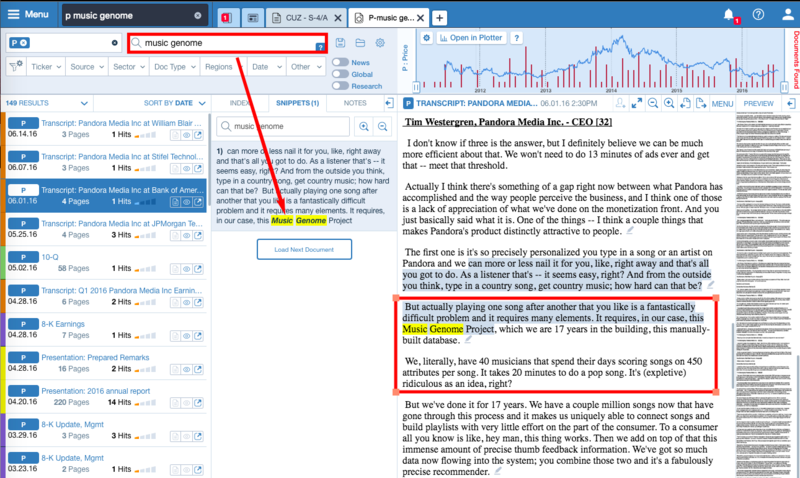 Doing everything to keep Pandora alive, from convincing employees to defer salaries, to maxing out personal credit cards, Tim’s vision of a Music Genome Project (US Patent 7,003,515) ultimately proved immensely valuable. But that was a decade ago. 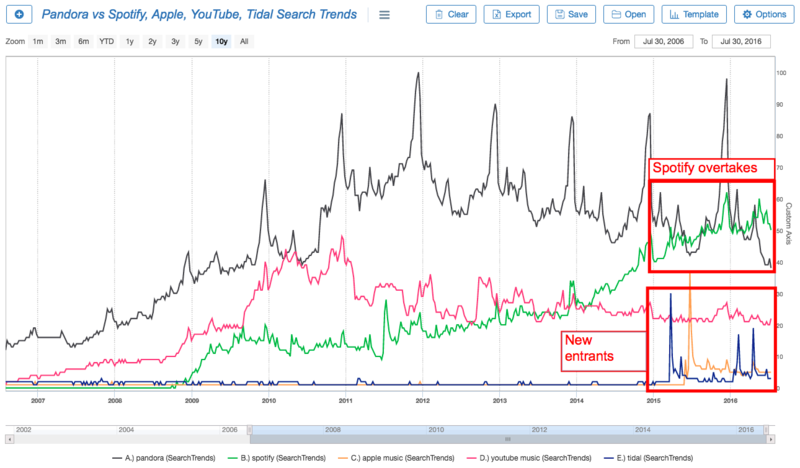 Since then, huge competitors from adjacencies like Apple ($AAPL) and Youtube ($GOOGL), well funded entrants like Amazon ($AMZN), to startups like Spotify and Tidal, have waded into the space with new technology. Spotify today was the subject of fresh discussions around an $8bn IPO while Pandora languishes at a $3bn market cap. A combination of 1) a subscription-based business model, 2) on-demand listening and 3) curated discovery has proven extremely successful and has presented a serious threat to Pandora’s lean-back, low ad load, passive listening model. How the Street has gotten Pandora’s modeling so very wrong – and is still doing it! Put your favorite playlist on, and let’s begin! Being subject to the twin threats of slowing growth and ramping costs, analysts have consistently proven far too bullish on the company’s out year economics. Two years ago analysts expected P to earn $450m in EBITDA in FY17. Now it is a coin toss if they break even. 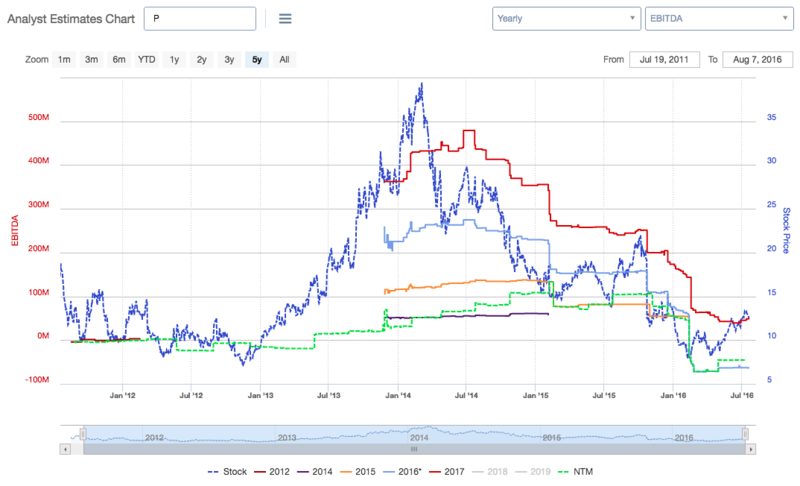 Here it is easily visualized in the Analyst Estimates Chart page of our Equity Data Terminal. Needless to say, Wall Street hasn’t learned a thing. Here are out year EBITDA estimates on our Annual Model page in Equity Data Terminal. Stocks with depressed expectations don’t make good shorts if its all in the price. With the CRB decision resolved with a better than expected outcome, bulls have looked forward this year to a fundamental change in Pandora’s business model as they struggle with making money against the backdrop of stagnant listener hours. Pandora is trying everything from buying Ticketfly to creating a concerts business to talking about an on demand model (which they are 6 years too late on). The depressed stock price and change in management have created hopes, garnered a wave of upgrades, and fueled a+60% short squeeze off February’s levels. Activists got involved and continue to hold out. We checked this on our premium Mosaic product, which we have written extensively about elsewhere: This hope would seem to be backed up by recovering web traffic data, although organic search interest seems deeply mired in the negative. What’s going on here? It would be nice to have a read on organic vs inorganic traffic on Pandora to see if this is just due to a pickup in ad spend. This is where having the ability to plug in your own custom datasets comes in handy. We were frustrated that existing financial data terminals don’t let you do this, and wanted something better than Excel which easily gets unwieldy to manage. This is why we created Plotter, our best-in-class financial visualization solution, and integrated Pathmatics’ digital ad intelligence into the Sentieo platform. 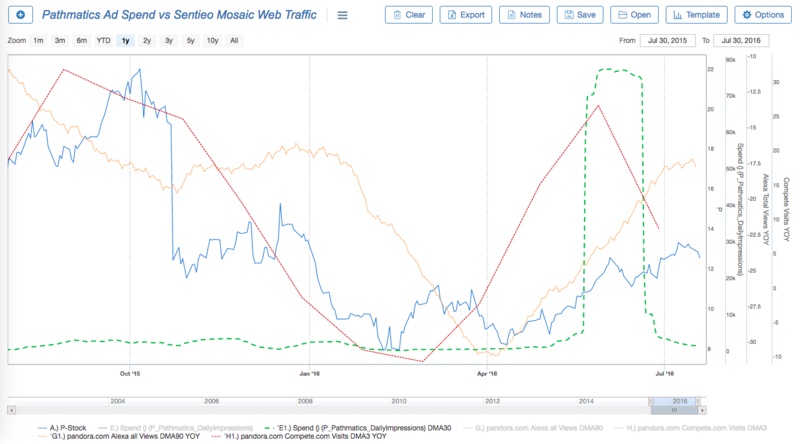 Here we have plotted Pandora’s stock and web traffic vs. Digital Ad Spend and Impressions data from our friends at Pathmatics. 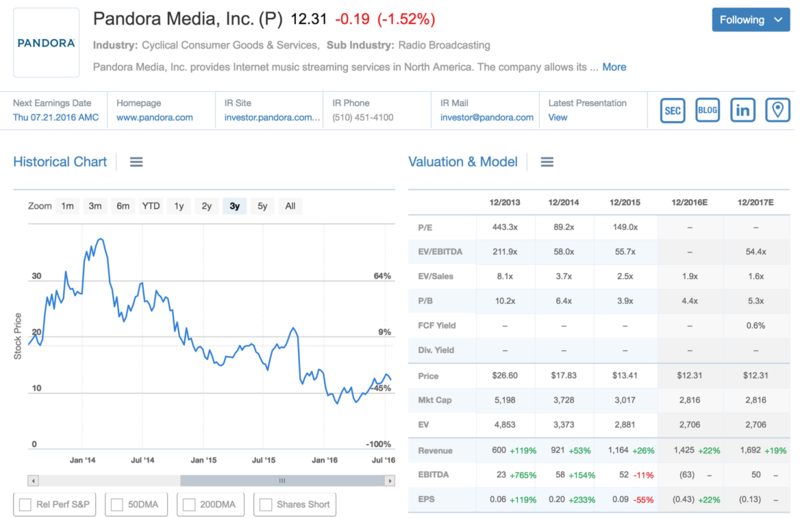 It is evident that Pandora’s stock is correlated to their web traffic, and given the nature of their internet radio business, this isn’t too controversial. The recovery since March-April 2016, following a TV advertising campaign, is accompanied by a significant spike in measured ad spend on digital. Pathmatics provides analytics products to the online display advertising industry. Utilizing its patent-pending technology, the company manages to analyze digital advertising activity and deliver real-time actionable digital and mobile intelligence to advertisers, agencies, publishers, and adtech providers. Doing a little digging into the data, it becomes evident that Pandora simply went out and put a bunch of ads on Youtube, increasingly a bigger player in streaming, and the market leader in the tastemaker demographic. Any relationship with YouTube Red? Why, yes. 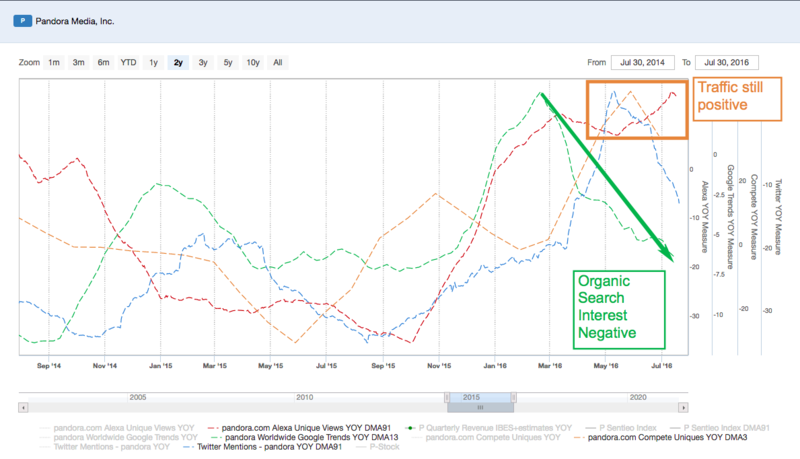 And a longer tail on Google Trends (green). 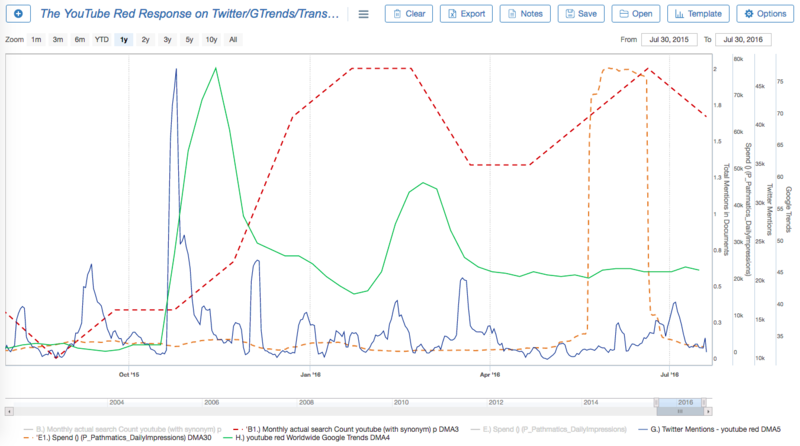 As the impact was felt, the company started talking increasingly more about Youtube in their public statements (red). The Pathmatics data (orange) shows an alarming spike in captured digital ad spend just months after Pandora management noticeably increased their frequency of discussing Youtube since October 2015. … Pandora is just a lean back product. And people listen to it 23 hours more, some people, a month. But they hear a song that reminds them of an album they want to listen to or a new artist that they want to hear more of. They pause Pandora and they go somewhere else because they can’t enter a specific song or an artist and listen to that on Pandora. And by bringing these other features and functionality we would like them to be able to do that within the Pandora environment. Right now, they pause, they go somewhere else, then they come back and we’re really good at retaining those people. But every time that happens you take the risk that we lose those users forever. And there’s a whole generation where we think that risk is higher than normal. Read: the cool kids. Pandora is very worried. So the overall implication for this quarter’s earnings report is: traffic is up and listener hours may be up, so on the surface it will look like a positive headline number, but organic interest is still down and they paid their newest competitor to get that traffic up. Until we hear more details on the aptly nicknamed “Pandora Two” tiered plans promised in Q4 (which, as we learned from Netflix’s earnings, has its own problems), the company seems to have no plan to get to that >400m EBITDA number the street needs to see for the stock to work. Maybe it never did. We are reminded of the classic scene from HBO’s Silicon Valley. In a very real sense, Pandora is back in startup mode, with its legendary founder back in charge, and pivoting in search of a relevant business model. We wish them well.